Hi there shoppers! 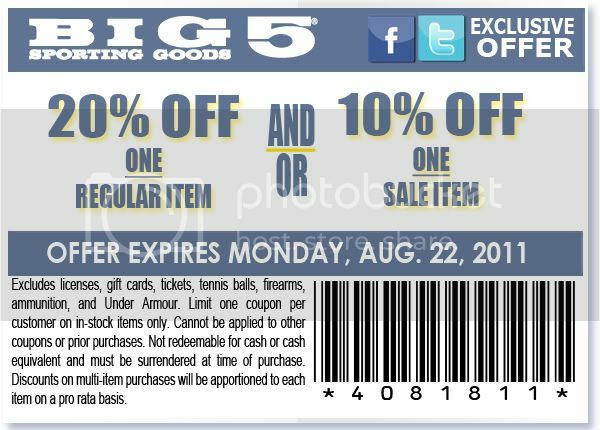 What we have for this time is the newest discount offer from Big 5. And, these are Big 5 printable coupons that we have here. So, it just means that, we are only allowed to use this deal on our next in-store shopping at them. Using these Big 5 printable coupons will let us all save a 10% or a 20% discount. These two deals got different qualifications. The 10% discount can only acquired if we will purchase at them a sale item while, the 20% discount can only be obtained if we will purchase a regular priced item at them. August 22, 2011 is the date of expiration of this deal. Enjoy the offer shoppers!